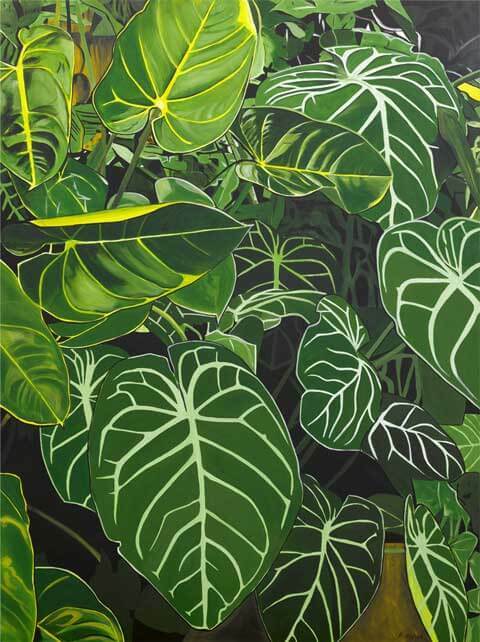 Painted a year after the artist’s first solo exhibition, Tropical Leaves takes a macro view of one of the many varieties of the Philodendron, an exotic rainforest plant. “I was inspired here by the the striking leaf vein pattern.” The subject can be found among the tropical houseplants in the Auckland Domain Wintergardens, which has an excellent selection of tropical plants and is one of the artist’s favourite places for inspiration. Acrylic on canvas, 2013.